If you don't know already from my past posts I have big news - I'm getting married in a couple weeks! For those of you who thought I dropped off the face of the planet, have no fear, after the wedding I will be back to my normal blogging:). 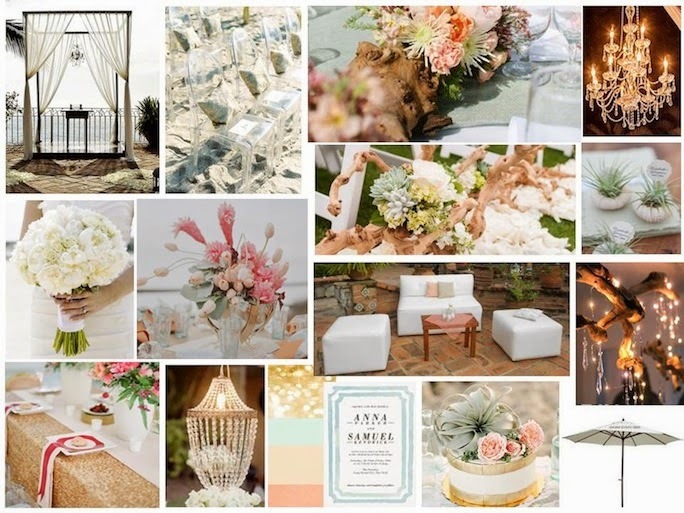 Today I'm so excited to share my wedding design inspiration board from my wedding planners, The Dazzling Details. Blaine and I are having a small wedding at a beach side Puerto Vallarta villa and the vibe is 'unique beach chic'. The picture of the alter and the seating area in the collage is actually from our very own wedding location! From random chandeliers to sea urchin place card holders, I can't wait to see what The Dazzling Details has in store for our big day. Viva la Mexico! *For more wedding inspiration check out The Dazzling Details' Facebook and website. The wedding set up is spectacular. I could have imagined to be wed with this setup too. From the table settings, to flowers and arrangements, everything looks pure and fresh. Amazing setup. My fave stuff is the on the right side with small pots and plants. love it! These wedding details are fantastic, love it. Love every detail in the posts. These wedding details are really dazzling but attractive.